Preparing timely and confidential information reports for insurance, estate planning, and general investment purposes. Where appropriate, clients receive confidential digital and/or hard copies of the database, with all documenting information including digital photographs. Periodic updating of the information will be available as required and requested. 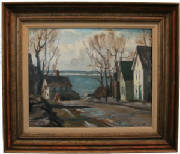 The Granite Shore Gallery provides guidance to individuals and organizations in the purchase and/or rental of fine art for the their enjoyment and the enjoyment of their publics. This includes such activities as the selection of individual pieces, the proper display of those pieces and addressing any related conservation issues. From time to time, the Granite Shore Gallery sponsors, either directly or collaboratively, events designed to increase the public’s awareness and appreciation of the fine arts. Examples of such events are: (1) Artists’ discussion and demonstration of their work; (2) Presentation by experts in various fields such as conservation, appraisal, and the art market; and (3) discussions by authors of published books and articles having to do with the arts.